When Earth is abruptly attacked by mysterious life forms called Heterodyne, the military finds itself powerless to stop the creatures. The desperate military makes use of the overwhelmingly destructive OE weaponry and stops the Heterodyne but not without heavy collateral damage. Following the battle, the anti-Heterodyne mecha Dai-guard was constructed to defend against future Heterodyne attacks. After years of peace, the Heterodyne threat has receded in the minds of the citizens and Dai-Guard has become nothing more than a giant promotional tool for the 21st Century Security Corporation. Now the Heterodyne have returned and Earth's best weapon is controlled by a corporation that cares more about quarterly profits then defense of the Earth. Not only that but the machine's pilots are three young employees that seem to be more experienced with Public Relations then fighting off alien invaders. I didn't really fully know what to expect when I went into this show. Several people I had talked to prior to seeing the show had made it sound like some sort of mecha parody. That isn't a very accurate description. 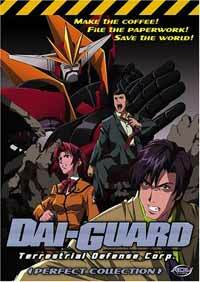 While Dai-Guard does contain a number of comedic elements and obviously has been influenced by a number of different mecha shows from the past, I would call it more an homage to the giant robot mecha genre than a parody. Long-time fans of the mecha genre will probably appreciate the various different elements in this title that bring to mind the different shows over the past few decades from the more classically styled Dai-Guard (or for that matter the rather older concept of having a team to pilot a mecha) to more modern influences such as the Heterodyne, who seem to be the cousins of Evangelion's Angels. Despite the inherently (and somewhat purposeful) derivative nature of the show, the show ends up still seeming quite entertaining and fresh overall. Though the show gets steadily more serious as it progresses, they maintain a light comedic touch that smoothly integrates with the more dramatic elements. They particular make good use of some of the more practical realities of giant robot combat to simultaneously explore some good story ideas and, on occasion, amuse the viewer. After all, 21st Century Security is a corporation and they have to worry about such mundane concerns as insurance payments for parts of the city destroyed during their battle. Dai-Guard's pilots have to deal with the realities of being the Earth's primary line of defense against a near constant menace while trying to still maintain their own lives...even if the overtime pay is good. Interestingly enough, I found that Dai-Guard actually did a better job of realistically and somewhat more naturally dealing with many plot issues than many of the more overly serious mecha shows out there. The military is far from pleased that Earth's main weapon is controlled by the PR section of a corporation and many officers in the corporation don't like having to depend on pilots who may or may not be concerned about corporate profits. The writers instead of ignoring such issues do a good job of integrating them directly into the plot and thus helping to strengthen the whole narrative. Also, for me, it was a nice change of pace to have a show centered around adult mecha pilots in a genre filled with angst-ridden teens. Character development is fairly strong in the title as well and most of the characters fairly likable in their own way. While some of the minor side characters don't get a lot of development beyond a few focus episodes, all the character work involving the primary characters is well done in a well-paced and iterative manner. None of the characters remain static and as the series closes, they have all grown and changed in ways that fit logically with their personalities. Despite the over-the-top nature of what the characters in Dai-Guard are having to deal with on a regular basis, they themselves come off as simply normal people trying to get a job done in an extraordinary situation. With the characters being fairly normal people, it made it a lot easier to relate to them. The humans really are the focus in this show as the Heterodyne end up coming off as almost a force of nature. The art work is fairly clean and attractive but I can't say it really stands out either. The animation works for the show but the bulky and somewhat clumsy nature of Dai-Guard doesn't quite make for slick action sequences. A lot of the anti-Heterodyne battles are more dependent on the pilots' strategies then any fascinating abilities of Dai-Guard itself. While this worked for me, I will admit that people seeking very smooth and impressive mecha battles might be a bit disappointed. However, the ever changing nature and appearance of the Heterodyne make for a number of creative encounters. Recommended Audience: There is a lot of mecha-on-Heterodyne violence. While most of the city (and province) in the show take a lot of damage, the actual amount of human collateral damage is kept pretty low. Overall, I would say it would be safe for older children and above.